There was once a time when giants filled the theatres. Two of these were Frankenstein and Dracula. Singly brand names, together unstoppable. Think rice and gravy, football and beer … American institutions. No, scratch that … Frankenstein and Dracula were (still are?) world institutions. Both had literary origins overseas. They’ve ping-ponged cash registers on both sides for more generations than any of us have been around. Universal draws blood yet from early thirties stones playing more profitably than anything else so old. A Frankenstein or Dracula one-sheet in your attic will buy a new house. For seven years after their initial release in 1931, showmen regarded them separately. Playdates were infrequent as Universal provided sequels (Bride Of Frankenstein, Dracula’s Daughter) beginning right where originals left off, but there were gold deposits untapped even as the mine’s route lay not hidden, but in plain sight. 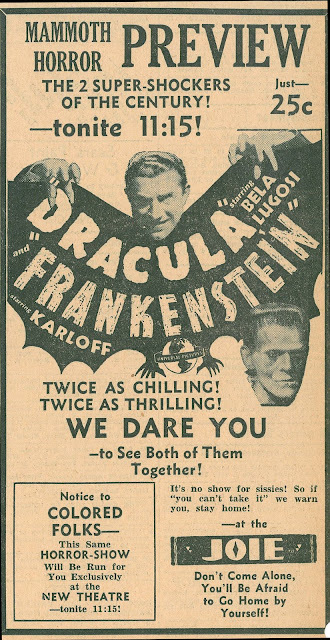 The magic was in combining them, but nobody thought of that until seemingly bungled reissues of Frankenstein and Dracula suddenly caught fire together in August 1938. For months running up, Universal’s salesmanship was as unimaginative as any they’d concocted for talking revivals, a concept just coming into its own by Spring of that year. To have (heavily) circulated oldies prior to this would have meant either pictures too recent, or (heaven forbid) silents. 1938 was the first season for heavy studio exploitation of vault product. A lot of that came of patron and showman requests. Demand was virtually catapulted by a shortage of new product, said the trades. Universal counted twenty-one favorites fans wanted back. Most were supplied by whatever prints an exchange might have on hand. An official re-release necessitated a fresh campaign and submission of the feature for a Code seal. Test engagements determined levels of interest in proposed titles. 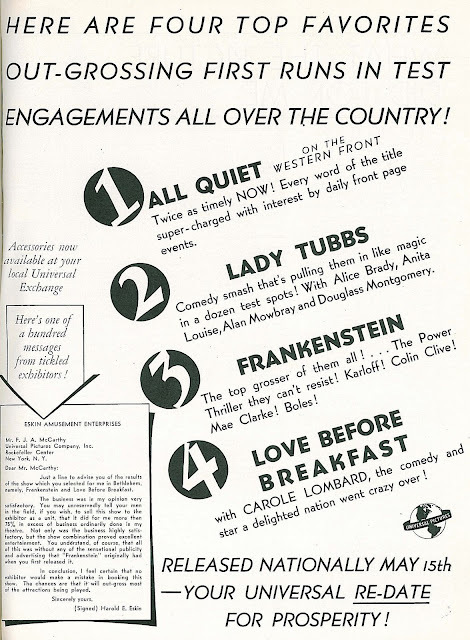 Universal tried out Frankenstein during March and April with three others, All Quiet On The Western Front, Lady Tubbs (a 1935 comedy with Alice Brady as a madcap crashing society), and Love Before Breakfast (with popular Carole Lombard), in both single and combo berths. Response was mixed. Harold S. Eskin, head of the Eskins Amusement Enterprises, was impressed. You may unreservedly tell your men in the field, if you wish, to sell this show (Frankenstein and Love Before Breakfast) to the exhibitor as a unit, that it did for me more than seventy-five percent in excess of business ordinarily done in my theatre. A New York booking of Frankenstein at 42nd Street’s Liberty Theatre was something else. It played off without causing much excitement (according to The Motion Picture Herald) during April. The few doors down Rialto repeated Dracula the same month, without impressive results. Owner Arthur Mayer spoke of both pictures having played (singly) every shooting gallery (a term for grind theatres) in town. Universal still regarded Frankenstein as promising enough to warrant a May 15 re-release date along with the three other tested oldies. Dracula became Number Five of these for the company’s 1938-39 season in early June. 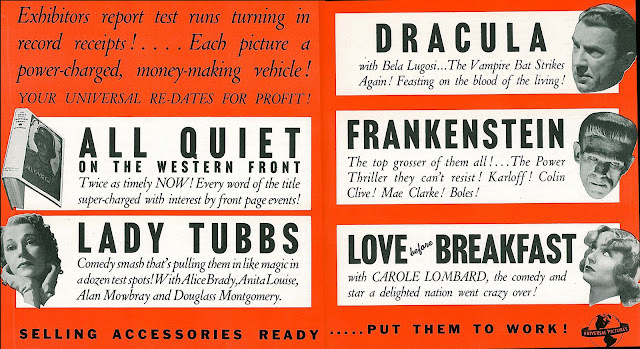 Trade ads promised accessories, including fresh trailers, but nothing was suggested with regards pairing the monsters. Showmen drawing from the list took so many pigs from a poke. B. Hollenbeck of the Rose Theatre in Sumas, Washington tried Dracula with Lady Tubbs. These two reissues were a complete flop here. Didn’t make running expenses. Is it safe to say Dracula was damned on this occasion by the company he kept? Both horrors got into some pretty horrific combinations. 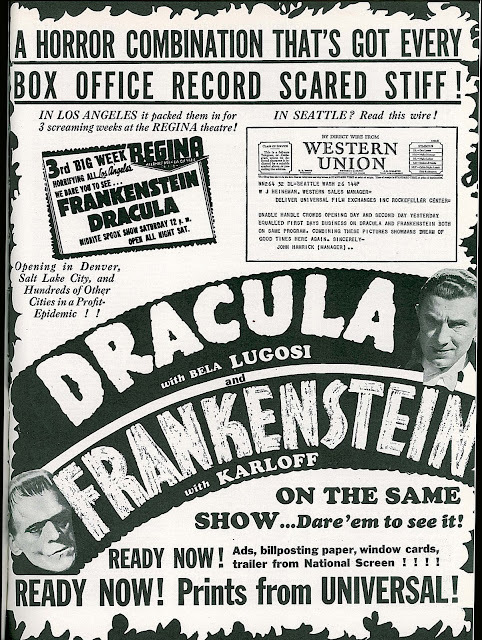 One theatre ran Frankenstein and Dracula on separate programs in support of "B" westerns. A lot of houses normally dark during summer months (because they lacked air-conditioning) kept lights burning with such cheaply bought fare. Universal’s monsters were clearly not being sold properly. As is so often the case, it was singular efforts of a genius showman that saved their bacon. The Regina was an 800-seat theatre at Wilshire and La Cienega in Los Angeles. It had opened on April 21, 1937 with a combo of Black Legion and That Girl From Paris. Seats were twenty-five cents for adults and a dime for children. The Regina got by mostly on sub-runs and reissues. Peter Lorre dropped in once to catch M, the German thriller that had made him famous. It was third on a bill with The Black Room and White Zombie. Lorre fell asleep in his seat waiting for M to start. A lot of patrons slept through parts or all of such double and/or triple bills at the Regina. 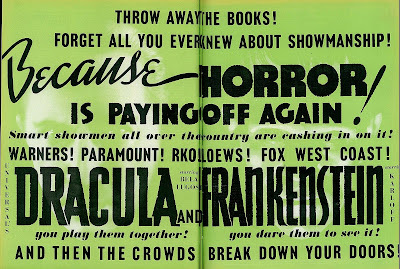 Their booking of Frankenstein and Dracula, along with RKO’s Son Of Kong, was intended to be a four-day run beginning Thursday, August 4, 1938. I’m specific about that date because it made history. Crowds jammed the front and manager Emil Umann found himself adding late (and later) shows to accommodate them. 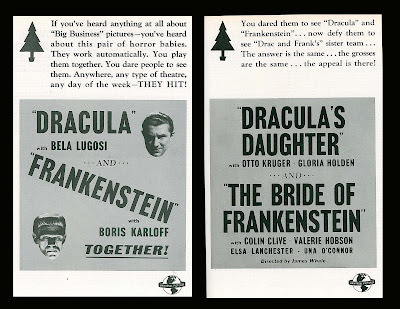 Legend persists that Umann rented long neglected prints of "Dracula" and "Frankenstein" at a film warehouse, but these titles, having been available on reissue for several months, were less neglected than mishandled. The inspiration, and a brilliant one, lay in combining them for the first time with a marquee (shown here) challenging the audience: Dare You See? Umann’s master stroke was no one’s idea but his own. Universal bookers driving to work watched him smash records daily with pictures they’d sold the Regina at flat rate. Within a week, trades were carrying accounts of the theatre’s smash biz and nightly stop-ins by Bela Lugosi, invited by Umann to appear with his star-making (once again) hit. I owe it all to that little man at the Regina Theatre. I was dead, and he brought me back to life, said Lugosi of his showman benefactor. A belatedly alerted Universal began laying plans of its own. Following the local stint, Lugosi will go on a prolonged personal appearance tour with the horror films, first taking in the west coast, then extending it throughout the country. Being a company without its own theatre chain, Universal’s reach was exceeding its grasp. Bookings, let alone favorable ones in "A" houses, came hardest to companies below the "Big Five's" integrated radar, which included Paramount, MGM, 20th Fox, RKO, and Warner Bros. They each owned theatres and together dominated every worthwhile territory in the nation. 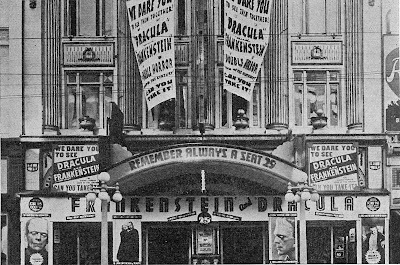 Universal faced its usual booking challenge with Dracula and Frankenstein, despite the combination’s remarkable success at the Regina. A second August run at Seattle’s Blue Mouse Theatre disabused notions that monsters in tandem were a fluke. Unable Handle Crowds Opening Day, reported manager John Hamrick in a telegram. Combining These Pictures Showman’s Dream Of Good Times Here Again. The Seattle Board Of Theatre Censors crabbed the party somewhat when it barred children under fifteen from attending on grounds that the intense excitement was harmful, a minor bump in Universal’s road toward a profit epidemic (per their ad) now confirmed. A September 3 trade ad shown here promised runs for Denver, Salt Lake City, and hundreds of other cities. Terms were generous to start as the company continued seeking wider traction. They got it after riots at Salt Lake City’s Victory Theatre all but necessitated that state’s militia. The house was sold out by ten o’clock in the morning. Four thousand frenzied Mormons milled around outside, finally broke through the police lines, smashed the plate glass boxoffice, bent in the front doors, and tore off one of the door checks in their eagerness to get in and be frightened. Management was forced to rent an empty theatre across the street to seat the overflow. Reels of Dracula and Frankenstein were bicycled back and forth in twenty-minute intervals throughout the day. The Victory’s triumph was bittersweet for Universal, as this theatre, like the Regina, booked its monster rally at a flat rate and therefore kept a lion's share of bounties. With their fad blossoming for a lucrative autumn, Universal would stiffen its terms and swing for the fences. Small-timer Umann took the brunt of Universal’s bounce when they yanked the Regina’s prints after a fourth week. Frankenstein and Dracula were moving up to downtown palace digs with more seats and percentage payoffs. It seemed a raw deal for the man who’d conceived such a winning plan. Universal sale staffers were given (and taking) credit for the company’s monstrous success as newspapers began recognizing the phenomenon. Throw Away The Rule Books! said trade ads on October 15, You Play Them Together! You Dare Them To See It! --- And Then The Crowds Break Down Your Doors! Salt Lake's fulfillment of the latter helped get the big circuits on board as of that month. Dracula and Frankenstein played Fox West Coast theatres plus major houses nationwide, and at last Universal was in for a piece of the action. The New York Times wrote up that town’s opening at Broadway’s Rialto Theatre and expressed the mainstream’s customary bemusement over a public’s frenzy for horror. Rialto manager Arthur Mayer was Harvard educated and knew how to milk the press for coverage of goings-on at his all day and night grindhouse. Those six hundred Rialto seats provided refuge for kids playing hooky, husbands who were supposed to be out looking for jobs, and guys on the run from the cops. They had an entrance door from the subway and through a basement arcade known as a hangout for troublemakers. Mayer was called The Merchant Of Menace and relished the tag (his Rialto premiered Universal chillers since Bride Of Frankenstein, which had bowed at the Roxy). Can You Take It? 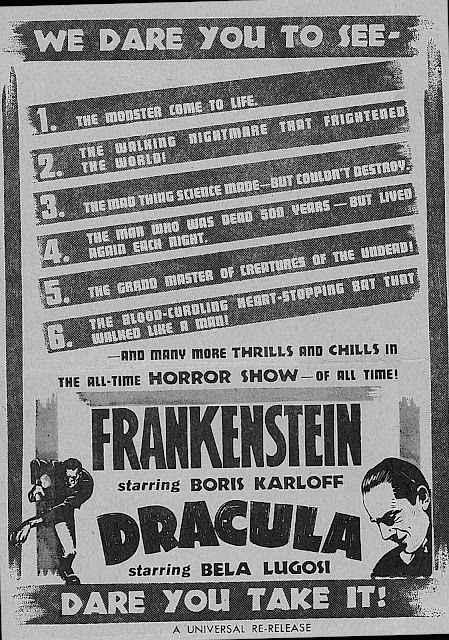 ads for Frankenstein and Dracula (one shown here, and note modesty of the Rialto's ad as compared with those for biggies like Suez and Young Dr. Kildare), plus imaginative front ballys, delivered $12,000 in the first week against an average weekly gross of $5,500. It was inevitable that others would try scaling Universal’s castle walls. Lacking names the equal of Frankenstein and Dracula, they nonetheless copied selling tactics of the We Dare You sort with results satisfactory but nowhere near what the first team was delivering. 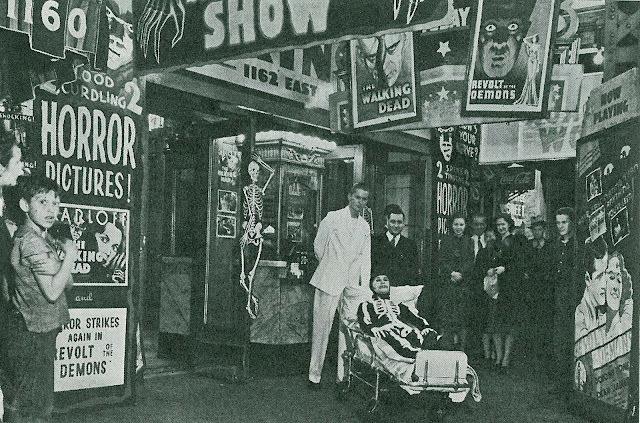 RKO came closest with its first major revival of King Kong since 1933, but most competing shows ran along lines of one shown here, with its doctor and stretcher attending game efforts to squeeze coin out of pretenders Revolt Of The Zombies and The Walking Dead. Exhibitors who knew better clung to the originals, however. These two pictures together (Frankenstein and Dracula) have all the rest of the horror pictures cheated a mile, said P.G. Held of Griswold, Iowa’s New Strand Theatre. Halloween meanwhile provided another surge for Universal’s monster merchandise. The Orson Welles War Of The Worlds broadcast on October 30, along with upset conditions in Europe and the Orient, further whetted a public’s appetite for shudder pictures, according to The Motion Picture Herald. 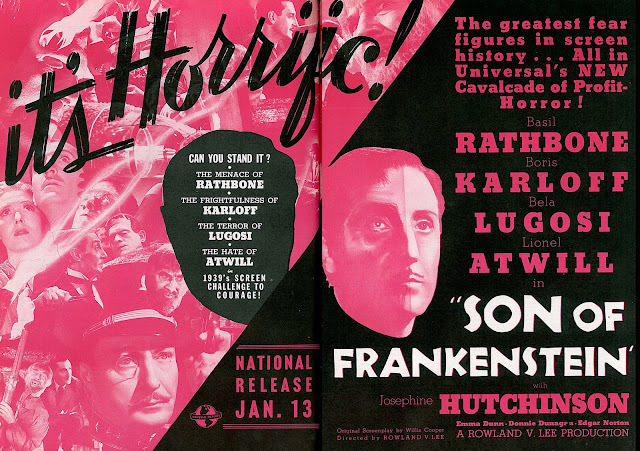 Universal announced Son Of Frankenstein for production starting November 9, with January 1939 release to follow. A pastiche culled from a Flash Gordon serial was hurriedly prepared and titled Mars Attacks The World in the wake of Welles’ newsmaking event. This went into many theatres right behind Frankenstein and Dracula where it often scored eighty percent of the combo’s business. 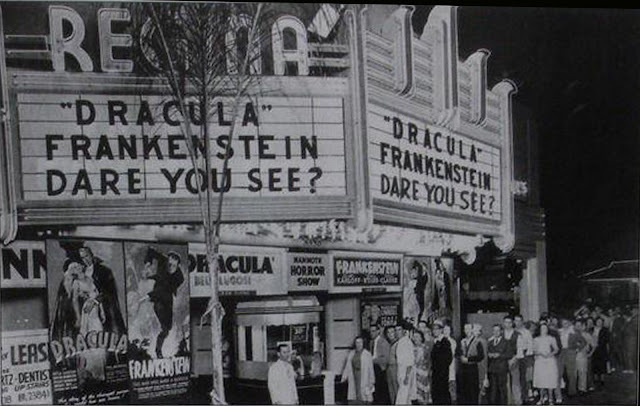 To maintain flows of reissue cash, Universal test ran a merger of Dracula’s Daughter with Bride Of Frankenstein at the Uptown Theatre in Kansas City during November. Results were sufficiently gratifying as to earn them a nationwide re-release later that month. Everything horrific was hot again, but how long were legs for 1938's monster boomlet? Explanation for much of Universal’s success was the dearth of new horror films during 1937 and 1938. Patrons frankly missed being chilled and wanted that old goose-bump feeling back. December saw Dracula and Frankenstein still harvesting the money tree. Universal boasted of a thousand bookings for the combo so far, and it expects four thousand more before the trend has run its course. This was really unprecedented, as most reissues stalled well below twelve hundred playdates. Crowded theatres served to benefit still in production Son Of Frankenstein as a duly impressed Universal increased expenditure for its sequel way beyond amounts previously invested in the genre. According to trades, the company had doubled its budget on "Son" to over $500,000, exclusive of large advertising appropriation. Final figures revealed exaggeration on Universal’s part, as negative costs on Son Of Frankenstein totaled $385,000, still a generous outlay for a monster pic. As to still playing originals, an order for five hundred new prints reflected confidence that both would run well into 1939, as Dracula and Frankenstein remained in service even after Son Of Frankenstein was released on January 13 and in some situations competed with the new attraction. If nothing else, the stunning success of Universal’s combo revealed the unique position these characters held in the public’s imagination, for combining them formed, at least in moviegoing parlance, as compelling a brand name as Coca-Cola and Kleenex tissue. Certainly it was Dracula and Frankenstein together that ushered in the second major horror film cycle at Universal. Sequels continued unabated through the war as monsters became more and more the exclusive province of kid and teen audiences. Bleak austerity of early 30’s incarnations seemed all the more so beside mid-forties monster rallies with their non-stop action and wall-to-wall musical scores, yet Dracula and Frankenstein maintained cache right through succeeding decades, and generations of fans. When time came for Universal to again try a thriller combo in 1947, their pick was not surprisingly those standbys that had delivered so well nine years before. "The Horror Boys" had long since been declared the safest bet for filling midnight tandem bills. 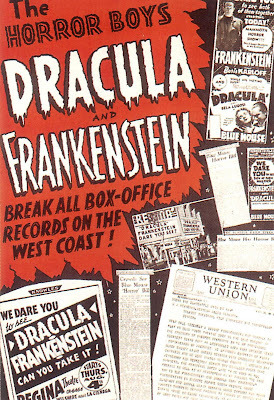 Dracula and Frankenstein would go on delivering as Realart leased distribution rights in both after the 1947 run. That subject and greater popularity the two enjoyed on television and as revered objects of an even bigger monster boom will be covered in Part Two. Was this the rerelease that had the prints of Frankenstein tinted green? My mother used to tell me that, either in 1931 or 38, one of the theatres in Sheboygan, WI, offered 10 Depression dollars to anyone who would dare sit through Frankenstein by themselves during a midnight show, and that no one took them up on it. You really out-did yourself this time -- fascinating! I practically "grew-up" at the Regina, only by the time I came along, it was no longer The Regina --it was called The Fine Arts (still is,the theatre is still there, still in operation, and pretty-much the same structure that's in the photo). Directly across the street, was the best drive-in that probably ever was, called "Dolores'". A wonderful, huge-hang-out, that must have been around even at that time, judging by the Art "Moderne" design in my memory. EVERBODY in the Bev. Hills area went to Dolores, and it's presense, with the waitresses on roller-skates, is truly missed by most of us who grew-up around there. Finally, there is an irony that might have escaped even your attention, John. In one of the newspaper ads you show, playing con-currently with the revival of "Frankenstein", is a current-offering at the "Trans-Lux" called "Port of Seven Seas", a Metro film (which later became the musical, "Fanny"), and which was a momentary, unhappy-alliance, as I understand it, between Metro and the "old" Universal team of Laemmle, Jr. and "Frankenstein's" god-father, James Whale! Great piece, my friend! R.J.
One final P.S. : Could the enormous success of this revival have prompted Lubitsch to think of casting Lugosi in "Ninotchka"?Lubitsch was quoted as saying at the time, "I thought it would be fun to see the terrible Russian commisar played by "Dracula". This might have jogged his memory, and provided Lugosi with one of his last real "A" jobs! R.J. I think one of the things that's still not fully appreciated is how completely our movie culture turned upside down over the years. Think about what was prestigious in 1936 or 1945. Now think about what the most familiar and most easily identified aspects of that era are among today's general public-- and almost without exception, they're things that were looked down upon back then. The horror movies of a second tier studio, Universal. The crudest of cheap-laugh comedians, the Three Stooges. The cartoons cranked out at Warner Bros., MGM, Fleischer-- not even Disney, but his low-rent competitors! Everybody knows that the baby boomers overthrew their parents' musical world, replacing Perry Como with the Rolling Stones, but it's just as true that they overthrew their movie world, replacing the A feature stars with the B list. Terrific post! Can't wait for part 2! Sorry some of these comments were slow going up. Somehow they ended up in my spam folder! Dave, it's my understanding there were green-tinted prints prepared for the 1938 "Frankenstein" prints, although Anonymous' reference to lavender tints for "Son Of Frankenstein" is a new one on me. Anybody else hear of that being done? RJ, I should have guessed you'd have grown up at the Regina/Fine Arts. 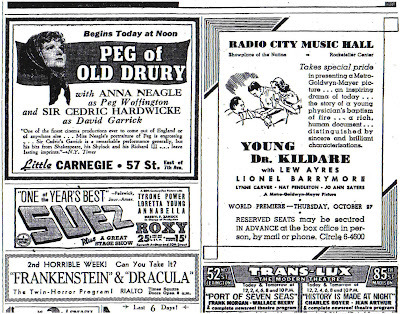 I saw recently where "A Place In The Sun" had its world premiere there in 1951. Must have been some hoppin' joint! It was great to get a full, in-depth article on THE double bill...Are the Regina or Rialto still around? I've also heard that it was during this reissue and the original that FRANKENSTEIN was tinted green. Fantastic job!! Great post, as usual!! Just one minor correction: The Mercury Theater's adaptation of "War of the Worlds" aired on 10/30/38, not on Halloween itself. By the way, I didn't see "Place In the Sun" when it opened at the Fine Arts (that was shall we say, a "tad" before my time), but it was an extremely popular place when I was a kid, John. My earliest movie-going recollections were there. I distinctly recall my parents' taking me to a revival of "Fantasia", then my coming home and flooding the bathroom (ala Mickey Mouse) by way of showing appreciation. And seeing something, another Disney, called "White Wilderness" (I think) because Jimmie Dodd, of the Mouseketeers, was appearing there and I wanted to meet him. I just remember Mr. Dodd and my mother being in deep conversation at some point, because Jimmie had known my grandfather at Warners! (He was a really nice man, by the way!) All these memories were triggered by your article, which by the way, should be published -- it's outstanding! (Please keep me posted on any future relatives' birthdays, will you? I'm bad on dates!) Best, R.J. This is a wonderful article about a truly fascinating topic. Can you (or anyone on here) recommend a good book about the history of the Universal Horrors? I would love to read something like that. I wish I were 10 in 1938. In his great history of contemporary horror, "The Monster Show", David Skal references this famous double bill. It is interesting that the following success of the "Shock Theatre" movie packages gave new life to gothic features - paving the way for Hammer films and Roger Corman´s adaptations of Edgar Allan Poe tales. The Rialto is no more, David, sad to say. The Regina is now the Fine Arts and has been refurbished. Thanks for the correction, Dr. OTR. I've just gone in and fixed that date. So how's Jackie Cooper getting along, RJ? I haven't seen him interviewed in years now. Is he well? Johnny, the best book for my money is "Universal Horrors" from McFarland. Many rare stills and in-depth text by experts. Go for it by all means! Axel, the David Skal book is an excellent one, as is everything he writes. Also, the main ad guy from Realart in those years was James H. Nicholson, later president of American International Pictures. I haven't spoken with Barbara Cooper as yet, but when I do, I will keep you appraised as to how Jackie's doing. Looking forward to Part 2 ...R.J.
Axel, the James H. Nicholson link to Realart, and his later "Teenage Frankenstein", is covered in Part Two, up now. What a shame this visionary died so young. Caught your comment about Bill. Yeah, he and my father were very tight (probably in both senses of the word), when I was quite small, but man, do I remember that obnoxious cigar-smoke! The thing I would really like to emphasize here (because it cannot be expressed clearly enough), is looking-backward, how genuinely nice all these people were to me at that age. They all seemed truly interested in, and more fascinated by me than I was by them! They used to call me "The Midget", because here I was surrounded by all these professional show-people, and far from being over-awed by them, just talked with them pretty much on their own level. I knew that, from a very early-age, this was the business I wanted to be in, and with all these creative influences I was surrounded by, can you blame me?